Four Three Two One by Courtney Stevens recounts the story of four young adults, all unique in their idiosyncrasies as they board Charter Bus 21 in New York City on June 15 bound for Ellis Island: Chandler Clayton is allergic to sudden changes but artistic with a sketch pad or a chain saw and logs; Golden Jennings is eager to explore the world beyond the towering oaks and billowing blue grass of Kentucky with her vintage No. 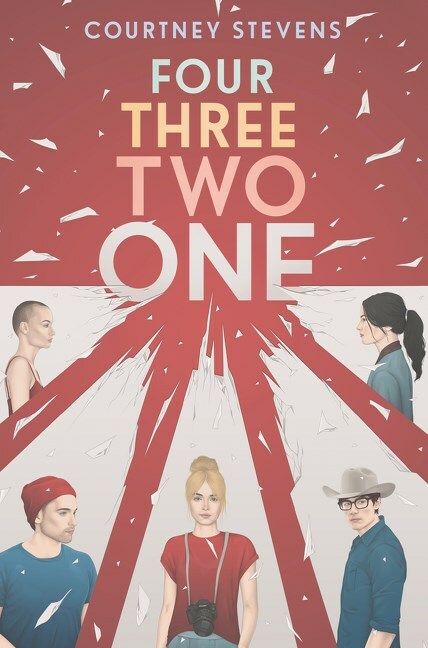 3 Kodak; Rudy Guthrie is a talented soccer athlete and a writer who has just won a scholarship to Emerson College in Boston; and Caroline Ascott from a wealthy wine-making family has goals to attend college and to write a book but is trapped in a toxic relationship with Simon Westwood. These four teens are also survivors of strange atrocities who now measure their lives with Before the Explosion of Bus 21 and After, hoping to keep living a full life with a damaged past rather than living a bomb-damaged life. When the four are invited to the opening of a memorial by Carter Stockton—a New York medic who decided to craft the remnants of Charter Bus #21 into a life-size art installment called Accelerant Orange and to start a college fund for the survivors—the invitation sets in motion a plethora of mixed feelings, questions, and confusion. Just as the explosion forever changed the lives of Chandler, Rudy, Golden, and Caroline, the story of the bus—its twenty dead and four survivors—climbs inside Carter Stockton and starts telling itself in the form of Accelerant Orange. Through Stockton’s efforts, readers understand that although a stranger can rob us of something precious, another half million will try to give it back. On their individual journeys to healing, the damaged teens learn that while stories can heal, they are also thieves—stealing perspective, peace, and courage. Golden declares that “part of [her] brain from June 15 is an Andy Warhol painting and part is spray painted black” (169) because of lost memories. Chandler refuses to speak about the event, Caroline is considering suicide, and Rudy is learning to navigate in a wheelchair. All four are consumed with guilt, wondering about the butterfly effect and whether their individual actions may have contributed to the ultimate chain of events. Playing what if and focusing on what has been lost not only has immobilizing effects but keeps their wounds bleeding. Perhaps making the trip back to New York for the ceremonial opening of Accelerant Orange will enable them not only to confront their fears and release their anger but to find closure and forgiveness. In dissecting anger, one often finds fear. Although being grounded provides a certain sense of security, it also prevents exploration and possible fulfillment. “When a hobby is tied to your heart, part of you is hooked in that space forever” (61). “There’s no way to Xerox a feeling. There was only telling someone the story and letting them apply their lens” (71). “Your role will always be. . . the role you tell yourself. So, please, dear God, tell yourself a better story” (358). “Sometimes weird people are more normal than you’d think” (367). Tagged belief, bus bombing, coming of age, forgiveness, friendship, hope, resilience, survivor story, trauma. Bookmark the permalink.